Stitching panorama pictures from a series of taken photos is simple, besides of buyable software like Panorama Studio or Autopano there’re even free alternatives like Microsoft ICE. But what if you have three series of pictures for the panorama – each serial taken with a different exposure time? 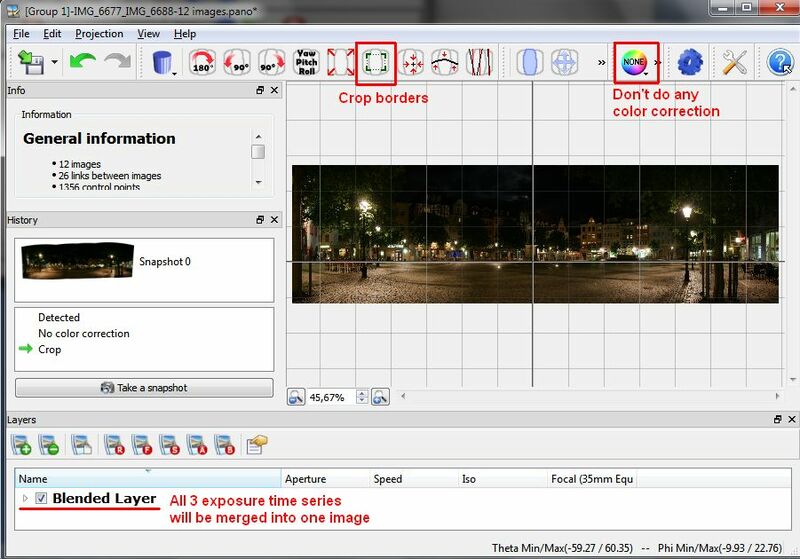 With single images it’s easy to merge the images into an HDR image by using Photoshop or Photomatix for example. 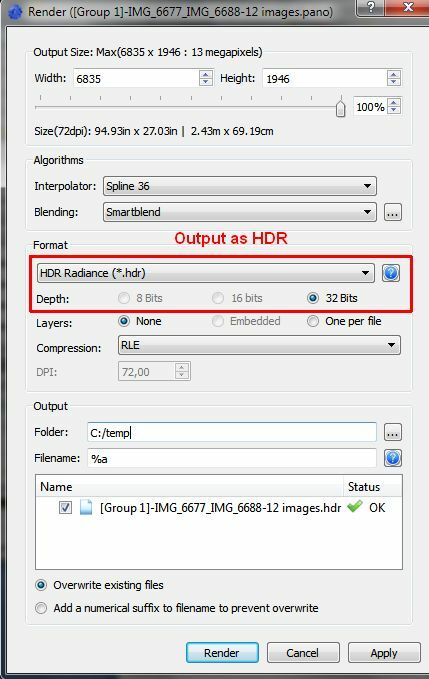 But combining both techniques into a HDR panorama is a little tricky, hence I wrote this tutorial with a solution that worked for me. 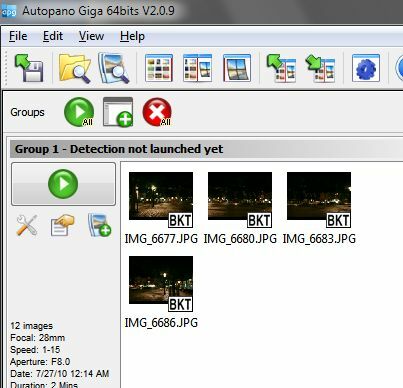 The “Giga” version of Autopano supports working with multiple exposure series. 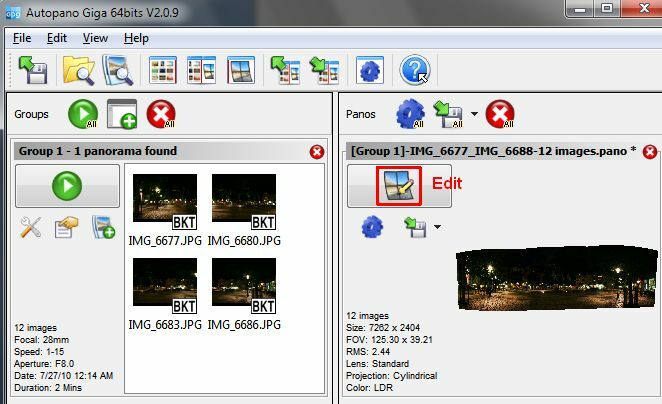 So my first idea is to just apply the Autopano workflow to all the pictures that will belong to the panorama. There’re 12 pictures in my case and Autopano automatically sorts them into 4 panorama parts (4 views á 3 different exposure times). Now I just apply the detection and change to the editing mode of the resulting panorama. There I choose not to apply any color correction (I want to tone map the HDR later anyway) plus I crop the borders. Notice the layer setting to output only one blended layer. Now I just render the panorama with one target .hdr file. So far so good. Next I open the hdr file I just created in Photomatix to do some tone mapping, but what’s this? Seems like this does not work the way I want to. There’re many ugly blending errors and the light spots are all overspilled! Ok, back to Autopano’s edit panorama mode. In the layer section I now chose “Group by speed” as I want to get a separate panorama image for each exposure serial, but with exactly the same panorama stitching (the three panoramas have to match each other exactly, otherwise the later HDR generation in Photomatix would screw up the .hdr entirely). Now again I render the panorama but not targeting one .hdr file. Instead I choose the 8Bits TIFF format. 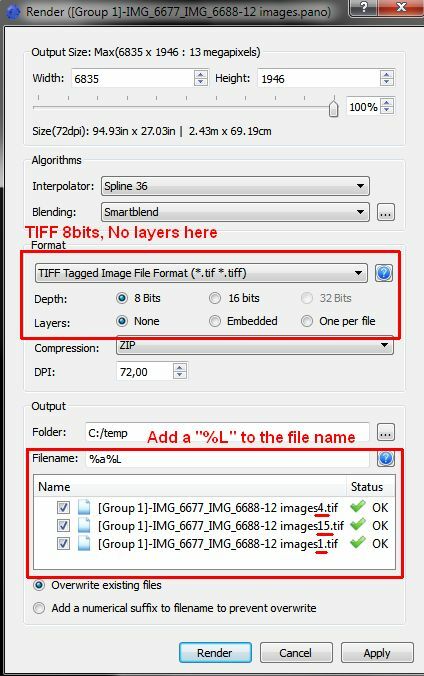 To get one TIFF per exposure serial I have to add a “%L” to the file name for the layer name. Great, after exporting I get three TIFF images with the stitched panorama for each exposure serial. The next step is as simple as I is with non-panoramic pictures. I just create a new panorama in Photomatix and deactivate the alignment tool (the panorama, taken using a tripod, is already aligned) and activate the ghost reduction for objects and people (this happens quite often with exposures lower than 5 seconds). Really important is to activate the noise reduction – otherwise the hdr will look like a Christmas tree. Finally, after applying the tone mapping and doing some little fixes in GIMP (sharpen, denoise, contrast), it’s a nice HDR panorama.